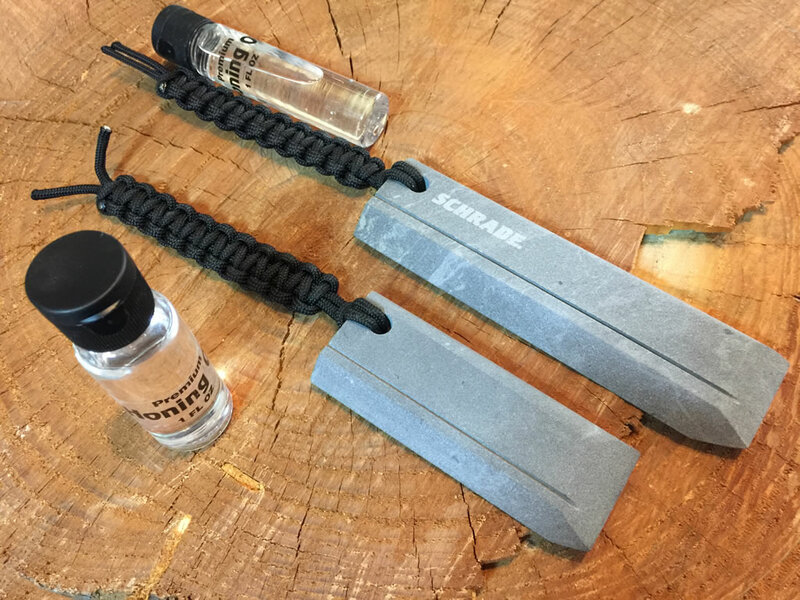 The SCTS4 and SCTS6 are Schrade’s 4″ and 6″ multi-functional Black Arkansas Sharpening Stones that are perfectly designed for putting a fine edge on blades in the field or at home. 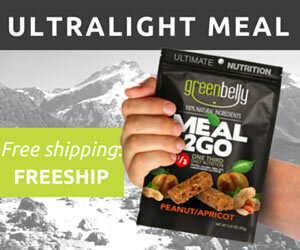 They are easily compact enough to fit in most any pocket. 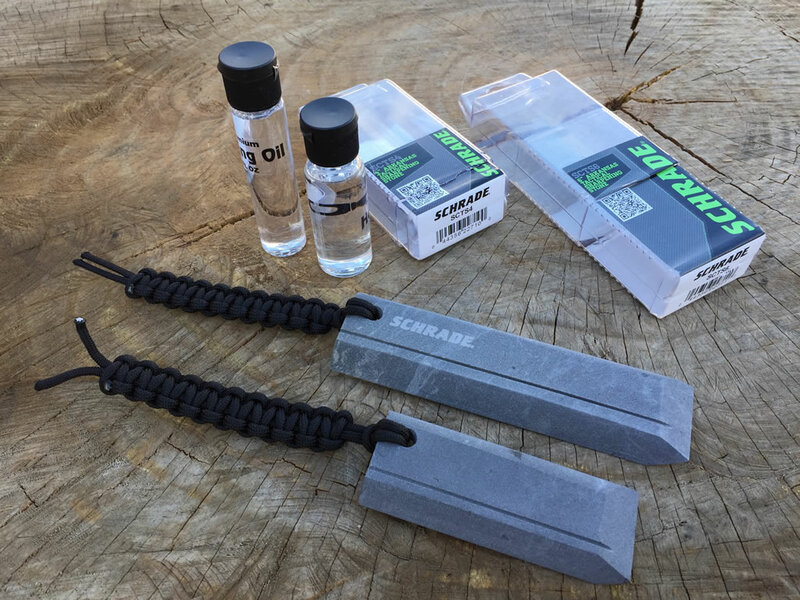 Each come with a black braided paracord lanyard and 1 fl oz of premium honing oil. Schrade has three Arkansas Stones in this product line. There is a small 3″ model called the SCTS3 in addition to the SCTS4 and SCTS6 that we’ll be focussing on in this article. The SCTS6 is 5.80″ long and weighs just shy a little of 5 ounces. The SCTS4 is 4.0″ long and weighs only 3 ounces. Each of the stones are 1.55″ wide, 0.4375″ thick. One side has a rounded edge, one side is set at a 45° angle, and the end of the stone is set at a 30° point. Along the flat area on the top of the stone, there is a shallow groove running end to end for sharpening hooks and catching some of the swarf. The heal of each stone has a .25″ lanyard hole with a black braided paracord lanyard 6″ long to hold on to while you are using the stone. Each stone also ships with one-fluid-ounce of clear honing oil. What is an Arkansas Stone? 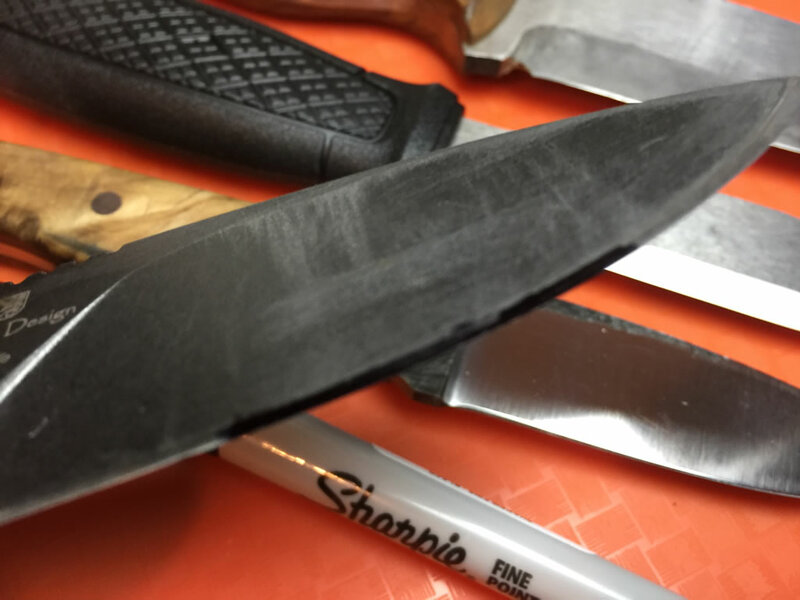 Whetstones are an effective way to sharpen knives, especially on some of the more challenging to sharpen like those with flat and Scandinavian grinds with no secondary bevel. They are not called whetstones because they are typically used with oil or water. The name actually comes from the verb, to whet which means to sharpen by rubbing on or with something such as a stone [To whet a knife]. Whetstones can be made from natural minerals like Novaculite quarried from the Ouachita Mountains in Arkansas, or from bonded synthetic abrasives composed of ceramic materials such as silicon carbide (carborundum) or aluminum oxide (corundum). The most common of the traditional Novaculite whetstones are Arkansas Stones, often referred to as oil stones or bench stones due to their fine grade. Unlike other sharpening stones, Arkansas Stones are graded by density and hardness rather than by grit. The coarsest of the Arkansas Stones, AKA Soft Arkansas Stones have a very loose Novaculite crystalline matrix structure making them much more abrasive than their denser counterparts. With an abrasiveness equivalent to a 400-800 grit synthetic stone, they are typically used for reprofiling an edge rather than general maintenance. Hard Arkansas Stones are right in the middle of the density and hardness spectrum which is why they are often considered a medium stone. They have a similar abrasiveness to that of an 800-1200 grit synthetic stone so they are a great starting point for performing general blade maintenance. Hard Translucent Arkansas Stones can vary from semi-transparent to opaque and typically range from solid white to solid black in color. Though it is also common to see various shades of brown interfused. Hard Translucent Stones are considered to be a fine-grade stone by most in the industry and are quickly becoming more and more rare. Hard Translucent Arkansas Stones at the furthest end of the density spectrum are considered to be an ultra-fine grade. These are slightly harder and extremely rare. Black Surgical Stones typically fall into this category… Ideal for sharpening razors and surgical tools. If you are using honing oil, the first step would be to place the Arkansas Stone on a solid surface and rub a liberal amount of honing oil into the stone. For the best results, keep adding oil until it is no longer absorbed and the entire surface area remains slightly wet. In addition to lubricating the cutting process and keeping the blade cool, the oil lifts the swarf and prevent it from clogging the stone. The swarf is a paste-like substance consisting of fine chips and filings of stone, metal and other material produced by a machining operation like sharpening a knife. I should also mention that the swarf is very abrasive. Keep this in mind when you go to wipe or wash it off your blade. It can scratch a highly polished blade if it is not washed off carefully. If you happen to be using water, you would be rubbing a liberal amount of water into the stone instead. Like with oil, you would keep adding water until it stops being absorbed and the entire surface area remains wet. In this case, the water performs the same function as the honing oil. It lubricates and keeps the blade cool in addition to preventing the swarf from clogging the stone. You can add a small amount of dish soap to the water for the best results. It is also important to note that it is not recommended to use water on a stone that has already been used with oil without going through an extraneous process of de-oiling the stone. The next step is to determine the grind angle. It is the part of the blade that angles toward the edge of the blade. Sharpening a blade with the correct grind-angle minimizes the loss of metal during the sharpening process and will lengthen the life of the blade. 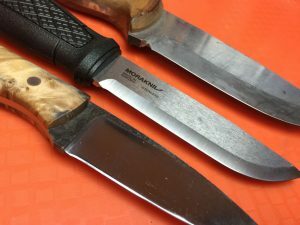 Some grind-angles are very steep like those commonly found on Scandinavian blades otherwise known as a Scandi-grind, or a flat grind that does not have a secondary bevel. These are generally more difficult to sharpen because they require polishing a much broader edge in order to maintain the blade’s original geometry. Blades with a convex grind are typically sharpened with a stone in order to maintain a convex edge. Using a flat stone will alter the edge geometry. Blades with a secondary bevel, on the other hand, have a very shallow grind angle that is typically very easy to maintain as they require the least amount of effort to sharpen. To find the correct angle, I always draw a line along the edge of the blade with a permanent marker. Then I make a few test passes across the surface of the stone. Holding the knife by the handle and the edge facing away from you, lay the edge of the blade against the stone with the grind angle parallel to the stone’s surface. Push the blade away from you with a diagonal swiping motion to ensure that the entire edge of the blade moves across the surface of the stone with a light, consistent pressure. If the angle is not obvious, I typically start with a 20° angle for most kitchen cutlery and a 17° for most survival and tactical -style knives. If the ink is gone, then you have the correct angle. If not, either you are holding the knife at too steep or too shallow of an angle as you make each pass. If so, simply adjust accordingly. Don’t worry… Sometimes it takes a few tries to get it right. Once you’ve determined the correct angle, stroke the blade across the surface of the stone a few more times with the same angle. Next, flip the blade over to work on the opposite edge. If you can’t use a push stroke, carefully draw the blade toward you an equal number of times, and with the exact same angle. Keep repeating the process, five strokes on each side of the blade until it has reached the desired sharpness. Just remember to keep the stone wet with whatever honing solution that you are using throughout the entire process. I found these Arkansas Stones to be incredibly hard… After completing the process of sharpening a few knives, I saw little to no wear on the surface of the stone at all. The final step of the process is to polish the edge of the blade with a leather strop and quality polishing compound like Herb’s Yellowstone Honing and Stropping Compound. In many cases, stropping the blade is all that is necessary to maintain a hair-popping edge. Whether the lubricant you are using is honing oil or water, over time the swarf tends to build up and clog the pores of the stone which will dramatically hinder its effectiveness. To clean a stone, simply place it in a container with warm to hot soapy water deep enough to fully submerge the stone. You can also scrub the stone with a scouring pad or a Mr. Clean Magic Eraser if the pores are extremely clogged. A Superaser for cleaning ceramic sharpeners has also been known to work quite well. Arkansas Stones can develop an uneven surface over time, though it can take years due to their extreme hardness. They are flattened by rubbing them against an abrasive on a hard, flat surface like a diamond stone, much like you would with any whetstone. Are these stones a worthy contender for that coveted space in your gear bag? The quality of these stones is very high. They are lightweight, compact, and they do their job quite well. The challenge is keeping the mess to a minimum if you choose to use honing oil. I prefer to use water myself. I find it so much easier to deal with. Just dry it and move on. Whether you prefer a small Arkansas Stone like one of these, a diamond field sharpener or a ceramic rod, it is really just a personal preference. I like to use ceramic rods or stones like these in the field when my blade needs more than a quick strop. 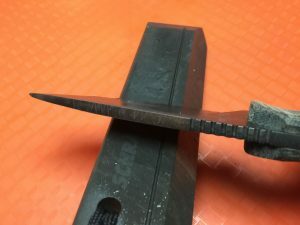 I find that diamond rod, plate, and other carbide draw-style sharpeners are far too abrasive and damaging to a blade when they only need a quick tune-up. Arkansas Stones like these are definitely high up on the list for maintaining my blades in the field. You can always find these stones and other Schrade products on Amazon. Founded by Stewart Taylor in 1975, Taylor Brands has been manufacturing, designing, and distributing high-quality stainless steel cutting tools and accessories since our inception. Taylor Brands owns and produces Schrade, Old Timer, Uncle Henry, and Imperial branded products, and are also licensed to produce multiple product lines under the world famous Smith & Wesson brand. 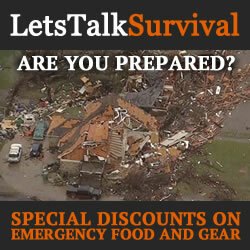 In total Taylor Brands manufactures several hundred different products including fixed and folding knives, collapsible batons, tactical pens, handcuffs, tactical and survival accessories, and flashlights.